Published for the fortieth anniversary of the final days of the Vietnam War, this is the suspenseful and moving tale of how John P. Riordan, an assistant manager of Citibank's Saigon branch, devised a daring plan to save 106 Vietnamese from the dangers of the Communist takeover. Riordan-who had left the military behind for a career in international banking-was not the type to take dramatic action, but once the North Vietnamese Army closed in on Saigon in April 1975 and it was clear that Riordan's Vietnamese colleagues and their families would be stranded in a city teetering on total collapse, he knew that he could not leave them behind. 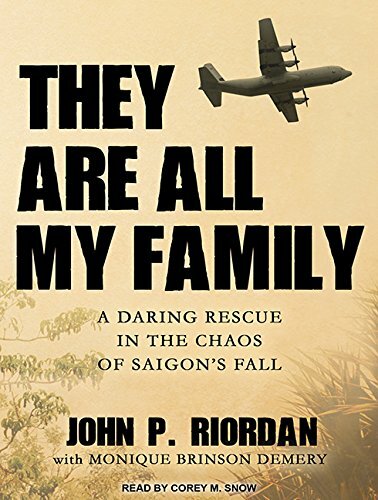 Defying the objections of his superiors and going against the official policy of the United States, Riordan went back into Saigon to save them. In fifteen harrowing trips to Saigon's airport, he maneuvered through the bureaucratic shambles, claiming that the Vietnamese were his wife and scores of children. It was a ruse that, at times, veered close to failure, yet against all odds, the improbable plan succeeded. They Are All My Family is a vivid narrative of one man's ingenious strategy that transformed a time of enormous peril into a display of extraordinary courage.